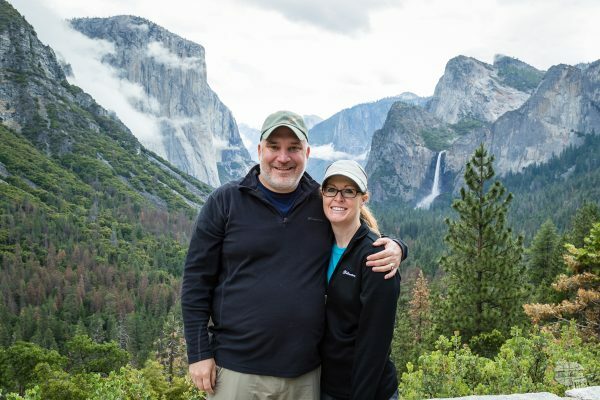 Grant Sinclair and his wife, Bonnie, both 42, purchased their first RV in 2016 and document their nature-filled adventures across the country on their travel blog, Our Wander-Filled Life. 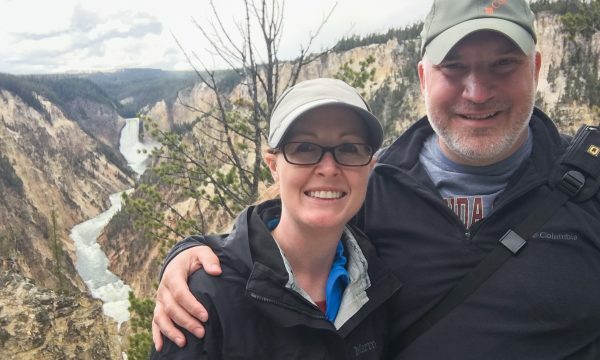 The couple, who teach at the same high school in Woodstock, Georgia, have visited more than 45 states and 19 countries together and wanted a recreational vehicle so they could travel more comfortably and for longer stretches of time. RVs continue to grow in popularity, but they’re not cheap: They can cost anywhere from $10,000 to $300,000 depending on the style, and that’s excluding costs like gas and maintenance. That’s why Sinclair spent years researching RVs before making the purchase. 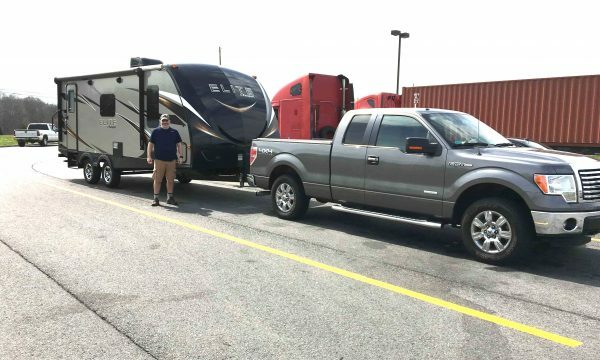 We asked him to share his RV-buying experience, how he and his wife saved, and what people should know before investing in one. Why did you decide to buy an RV? We had been looking into getting an RV since 2014. We had been tent camping — which was our way to save on road trips in the summer — and realized it was killing our backs. We were starting to take longer trips, sometimes for more than a month, and had also been leaving our cat behind. We knew we’d need something with air conditioning in order to travel with the cat. 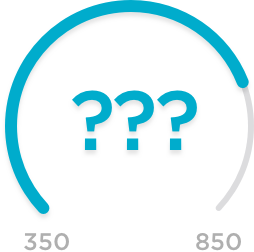 What’s your overall approach to personal finance? We both work full-time as teachers. We’re frugal with our money: We have one vehicle since we teach at the same school, so that’s one car payment. We save a decent amount of money for travel every month and are constantly putting money away to take bigger trips. We use Mint to track expenses and use credit cards extensively to accumulate points and miles, but we pay them off every month. How do you have so much time off to travel? We have been traveling extensively since we started dating in 2009. Our school is on a modified year-round calendar, so we get several weeks off during the year and are out of school for the summer right around Memorial Day. We have seven weeks off during the summer to get out and play, and we make it a point to travel every one of those breaks. We’ve been to 45 states, 19 countries and 198 units of the National Park Service, which includes national parks, national monuments, national reserves and national historic sites. We’re big time national parks people. How did you research RVs? We started going to RV shows from time to time, where RV dealers rent out a convention space so you can see which models are on the market. RV shows are a great opportunity to see tons of RVs. We looked at floor plans left and right. It got mind-numbing after a while, but we finalized which one we wanted. We learned an important lesson about that: You look for a floor plan that matches what you need, just like buying a house. We don’t have kids, so we knew bunk beds would be a waste of money. What was the actual RV-buying process like? In the spring of 2016, we paid off some bills and had leftover money to afford an RV payment. We decided to go to an RV show one weekend, knowing that they offer good deals at the end of the show to buy one right on the spot. Unfortunately, they didn’t have the floor plan we wanted at the show. But we did find a model we liked: the Keystone Passport Elite 23R. We found one on RVTrader.com, but they didn’t want to negotiate at all, so we drove about 90 miles to Dalton, Georgia, to go to a dealership that was selling that model. They had three left on the lot. My original budget was $25,000. The sticker price was $28,000, but I thought I could get it for $25,000. I offered $20,000 and he came back with $24,000. We did research and that was the cheapest price we could find for 300 miles. I asked the dealer to throw in a weight-distributing hitch, worth $350. We financed it instead of paying for it all upfront. We knew we had a significant tax return coming to us, so we were able to put 10% down on the RV and spend the rest of the return on additional stuff for the RV. The RV dealership we went to was laid back, and the financing was quite easy for us. We didn’t fill out paperwork until we had been pre-qualified on the phone, so it was a breeze. 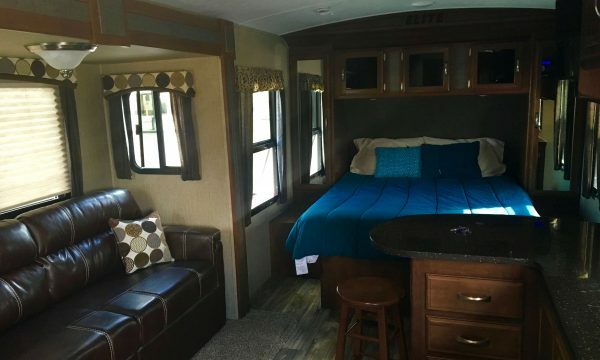 One benefit of an RV that most people don’t think about is that it’s considered a second home for tax purposes if it has a kitchen and a bathroom. That’s why we were willing to finance, because we knew we could deduct interest off our taxes. What other costs did you have to consider? You have to remember that your camper is a second home on wheels. You’ll have additional expenses like you would with a home. We had to factor in money for fuel and storage. We live in a condo that doesn’t allow RV parking, but we had been paying for a storage unit for our camping gear and were able to pay $5 more a month to store our RV there. You also need a fresh water hose, a water pressure regulator, wheel levelers in case you’re at an uneven campsite, and a surge protector. There’s also a one-time purchase for power management, which is basically an advanced surge protector for an RV, which runs around $200 to $250. Other things that are nice to have include a cordless drill, a jack adapter and freezer packs to keep perishable foods in the fridge. I would have had the dealership add a solar battery so we could stay in places without electricity. If you’re looking to buy a camper and get out in nature, I can’t recommend getting solar enough. Ask the dealer to install it while you’re there, before you even pick it up. Where have you gone with the RV? Any upcoming plans? Our first major trip was going to all of the states in New England and nearly all of the national park sites in that region in six weeks. We’ve also taken it to Yosemite National Park, stopping in Arizona and Nevada along the way. This past summer we went to the national parks in Washington state. Next summer we’ll visit the Great Lakes. What’s your favorite memory in the RV? My favorite place we’ve stayed is Yellowstone National Park. Our RV let us explore easily from the heart of the park and see wildlife that we would have missed otherwise. One night we ate an early dinner and pulled into an overlook, and there was a pack of wolves moving toward a herd of elk. What advice do you have for people who are considering buying one? It’s a big purchase. A travel trailer is every bit as expensive as a boat and can even be as expensive as a house. Before you make the purchase, have a real discussion about how much you’re going to use it. If you’re only camping once or twice a year, then it’s not worth it. 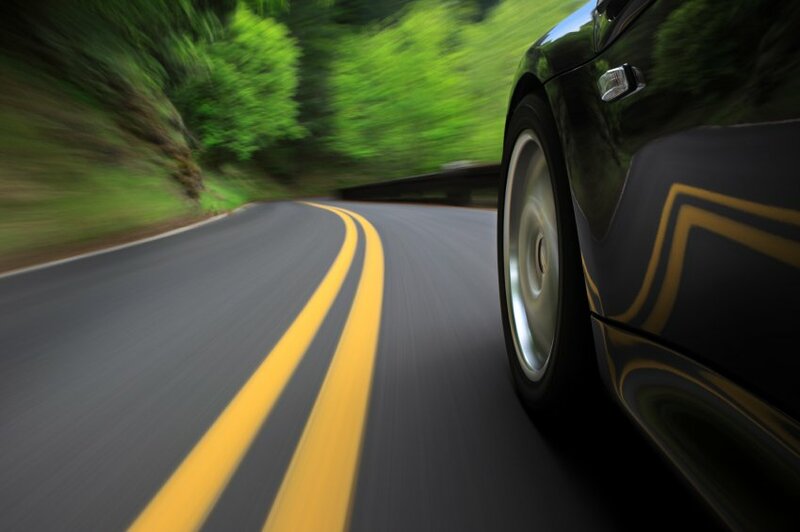 The RV, like any car, will deteriorate over time if you’re leaving it sitting around. There are plenty of places that rent RVs. With that said, rentals are expensive. When we did the math, renting an RV was just as expensive as renting a car and getting a hotel every night. We figured out that we’re saving 40% by staying in our RV versus a hotel. Also, if you’re serious about it, don’t get a cheap, pop-up camper. People don’t realize how much owning and towing it will depreciate the value. Buy something that you know you’ll like and will use and enjoy right off the bat.